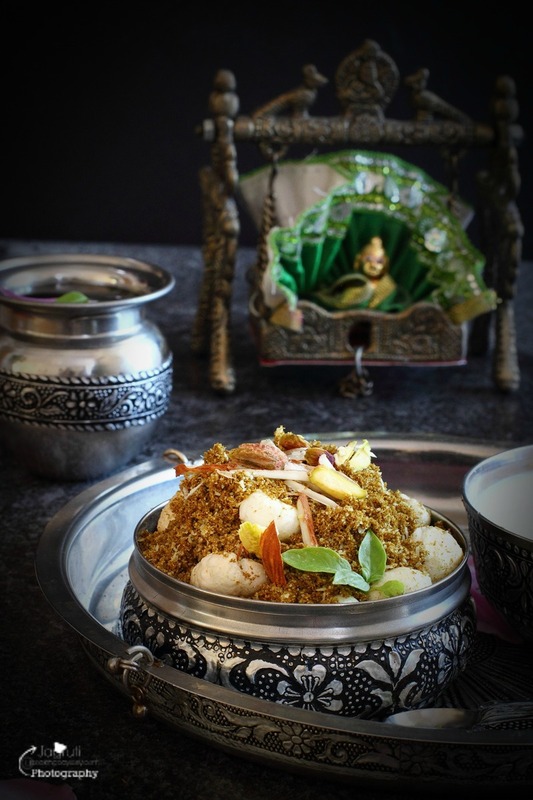 Dhaniya Panjiri is served only on Janmasthmi day to Lord Krishna alongside other delicacies. Butter, milk, yogurt and other dairy products like peda are some examples. 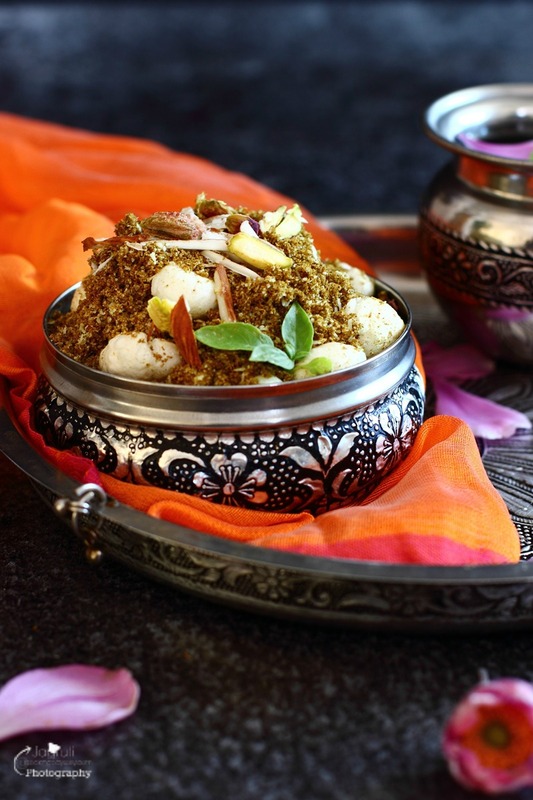 Panjiri is primarily made from coriander powder, sugar, ghee and dry fruits. During Janmasthmi, many people fast. Before they break their fast this Dhaniya Panjiri is eaten. Pure ghee - 2 tbsp. Phool Makhane - 3 tbsp. Desiccated coconut - 2 tbsp. Almonds, Cashews and Pistachio Nuts - 3-4 tbsp. Heat very little ghee in a kadai, add nuts and fry for few minutes, remove it from the kadai and add phool makhane and roast til they get crunchy. Remove from the kadai and let it cool. In same kadai add coconut and roast lightly. Remove it. Add remaining ghee in the kadai, add coriander powder and roast it for couple of minutes. Slice the roasted nuts and makhane. 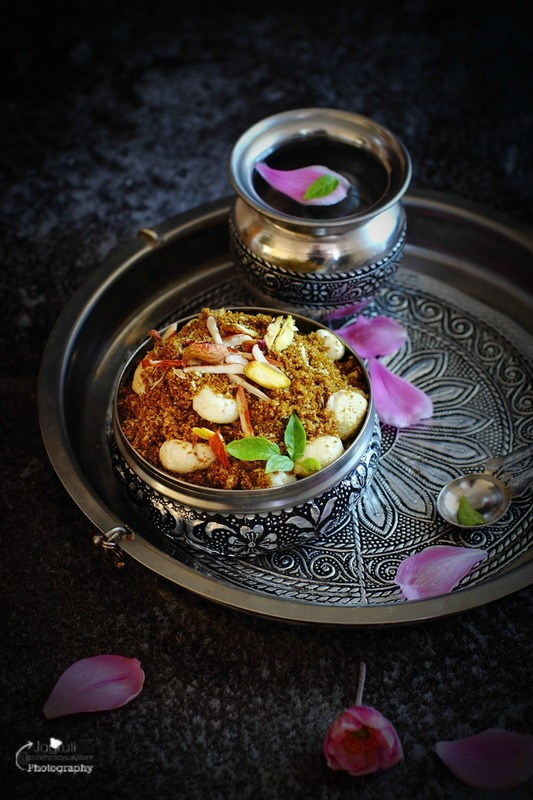 Combine sugar, roasted coconut, nuts and makhane with the roasted coriander powder. Serve in a serving dish and garnish with the tulsi leaves.